← DUELING DIVAS ARE ALMOST HERE!! DUELING DIVAS BLOGATHON DAY 1: Judy Garland vs. Grace Kelly–1954. For my first day of dueling divas, I am devoting my attention to that well-publicized “scandal” at the 1954 Oscars between Judy Garland and Grace Kelly. 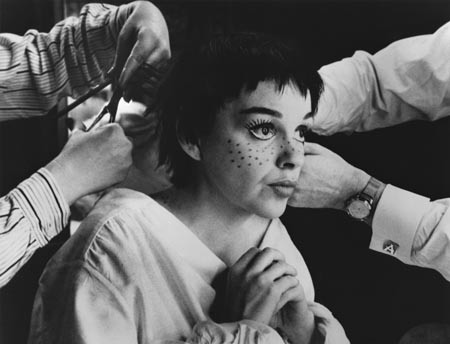 Now I must admit that I am a bit biased on the subject–as readers of my blog know, I am a HUGE Judy Garland fan, and have been since very early childhood. For years I had a chip on my shoulder about Grace Kelly, refusing to see The Country Girl (the film for which she was nominated) in protest of the outcome of the 1954 Oscars. Why all this hullabaloo, you ask? Well, let’s start at the beginning. In order to understand the significance of the 1954 Oscars for Judy Garland, we must revisit Judy’s career at MGM. She was signed to a contract in 1935, and shortly thereafter she was put into a virtual treadmill of productions that wore her young body out. She was given pills to sleep, pills to stay awake, and pills to make her lose weight, which in addition to the stress of her life at MGM, contributed to psychological problems and a severe addiction that culminated in the late 1940’s. Following a particularly difficult time on the set of Annie Get Your Gun (from which she was ultimately fired and replaced by Betty Hutton) and failure to appear on the set of Royal Wedding (in which she was replaced by Jane Powell), MGM suspended her contract and Judy Garland was a movie has-been at 28. Almost immediately, however, she bounced back with an absolutely stellar concert career, playing some of the best houses in the world and breaking records at the Palace Theatre with her 19-week one-woman show. In the early 1950’s, Judy Garland was on top of the world, free from MGM and able to spread her wings to tackle anything. It is often said that the producer of the Palace show, Sid Luft, was almost solely responsible for her career revival, and the two married in 1952. Two years later, he was producing A Star is Born, heralded as Judy’s magnificent comeback to movies, and one that brought Judy her first Academy Award nomination as Best Actress. All of Hollywood was abuzz about her performance, and everyone was convinced that it would bring her an Oscar–if not for her performance alone, then for the audience’s love and affection for her as a person and an entertainer. So convinced was everyone that she would win, that when she was unable to attend the Oscars ceremony due to having just given birth to her 3rd child, cameras were set up in her hospital room to televise her acceptance speech. Poor Grace Kelly. Due to the legions of Judy fans across the world, she has developed a bit of a bad name, through no fault of her own. I am the first to admit that until about 7th grade, I held a major grudge against Grace Kelly. It wasn’t until I forced myself to read a biography and watch a few of her movies that I came around to her, and developed a great respect for her as a dignified human being (one of my favorite anecdotes is that when Josephine Baker was refused service in the Stork Club while Grace was dining there, she grabbed Josephine by the arm, stormed out, and vowed never to eat there again. She never did, the two embarked upon a lifelong friendship). Her performance in The Country Girl, as much as some Judy fans may hate me for this, is brilliant. But I still think Judy should have won! This post is an entry in the Dueling Divas blogathon! Well, yes, Judy SHOULD have won, of course,but the best performance frequently doesn’t win.Being a gracious loser really is an art! Lovely post on 2 great divas. I agree that Judy should have won that Oscar – but if she lost the battle, she may have won the war. Beautiful Grace was talented but is remembered more today for her stylish loveliness and life role as “Princess Grace of Monaco” than her performance in “The Country Girl.” In fact, her appearances in two Hitchcock films, “Rear Window” and “To Catch a Thief,” are better known than the film for which she won her Oscar. Judy, of course, endures as one of the iconic talents of the 20th Century – on film, on record, on TV and on the concert stage. Anyone who has seen “The Wizard of Oz,” “Meet Me in St. Louis,” “The Clock,” “A Star is Born,” her wonderful ’63/64 CBS show, etc., understands that Judy didn’t “need no stinkin’ Oscar” (though she did win a deserved juvenile award in 1940). I love both actress, but I agree.. Judy SHOULD have won that Oscar. I can not imagine her disappointment . I love Grace Kelly and Judy Garland and agree that her performance in “a Star is Born” is much more notable than Grace Kelly’s in “Country Girl” but I don’t think that is why people voted for Grace but instead all other films and Grace Kelly herself.